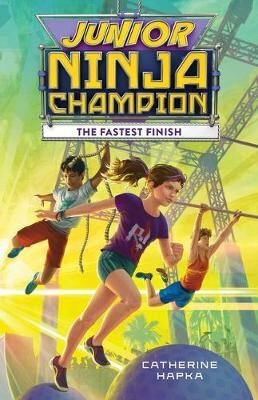 The second book in this action-packed adventure series follows a team of young ninjas to the final round of the first-ever Junior Ninja competition--perfect for young ninjas and ninja fans everywhere! When tweens Izzy, Ty, Kevin, JJ, and Mackenzie heard there was going to be a kids' version of the reality-TV obstacle competition National Ninja Champion, they all found themselves drawn to Fit Kidz Gym. They quickly formed a team--training together and helping one another overcome all kinds of obstacles as they tried out for a spot on Junior Ninja Champion. It's surreal but exciting to watch themselves on TV . . . and the show is a huge hit! Now Izzy and JJ are headed to the finals in Hollywood, and the rest of the team is coming along to cheer them on. Ty is an alternate, hoping for his shot at glory. But when the show throws them a curve ball and announces a wildcard episode, it brings a new competitor to the Fit Kidz team and takes the competition up a notch. Who will lose their grip on victory, and who will climb their way to the top on the first season of Junior Ninja Champion?